12/19/2016 | KITAMURA Junko — dai ichi arts, Ltd.
We would like to take this opportunity to express our sincere gratitude for your continued support and care. You have helped us grow strong. Happy holidays to you and your loved ones. In conceiving this series, I have done a lot of thinking on the strong traits of Asian women artists. Many are kind, loving, and fun, but their most constant characteristic is their steadiness. They are detail oriented and patient, and their work often reflects this. Kitamura Junko's work certainly embodies these traits: her careful patterning reveals an attention to detail and an eye for design that is unsurpassed. This beautiful double-walled shallow bowl radiates a quiet confidence. The piece was wheel-thrown and then folded inward, giving the work a soft, organic feel completely without edges. 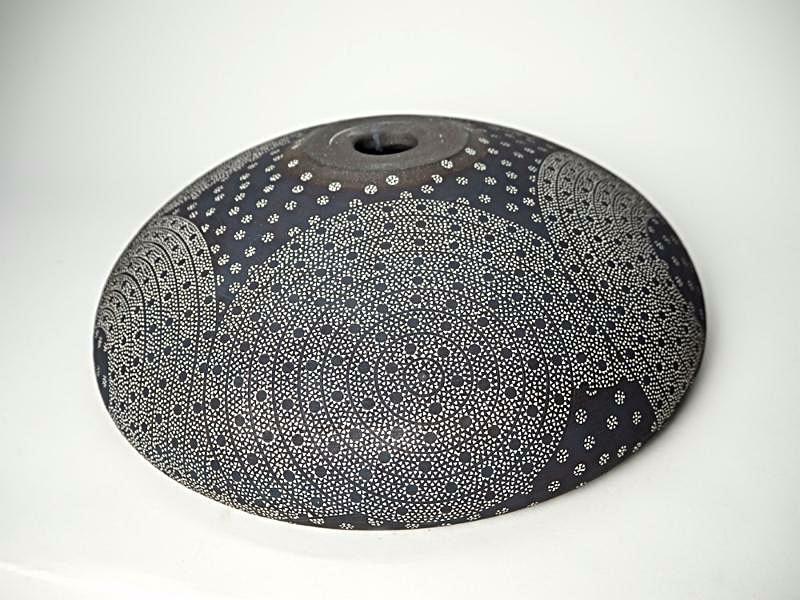 Kitamura has stamped her seal onto the soft clay spontaneously, filling in this pattern with creamy white slip to reveal organic swirls of stamps. These is no pre-conceived design here, she let her heart lead her hand, building up a design with dynamic organic feeling. There is no beginning or end to this design, but rather it can be followed around the bowl in almost infinite variations. 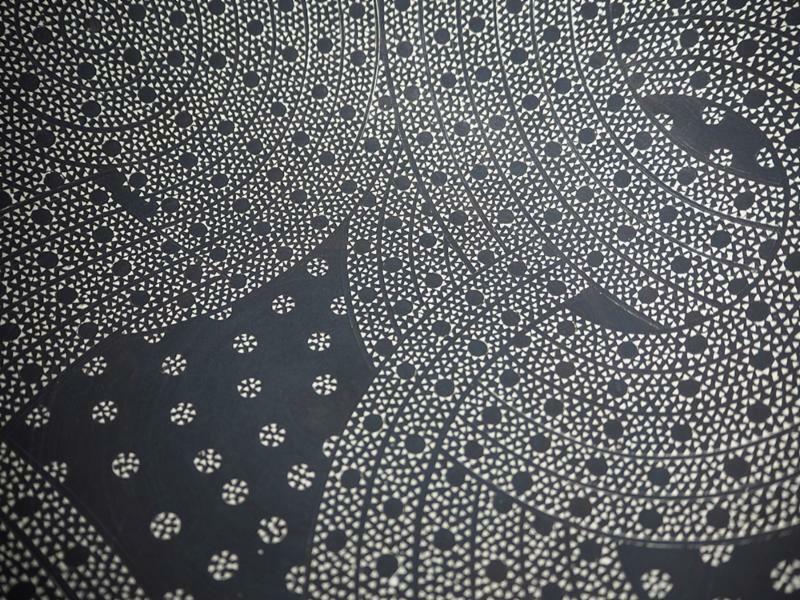 Kitamura's original passion was in fabric dyeing, and her stamped ceramic patterns grow from this early experience. This stamp technique can be traced back to Korean ceramics, where is it called Mishimade. The most famous practitioner of this technique is Living National Treasure Shimaoka Tatsuzo 島岡達三 (1919- 2007). Kitamura completed her MFA at the Kyoto City University of Art, where Suzuki Osamu and many other pioneering ceramic artists are teachers. Like them, Kitamura is a shining star! She has won several prestigious awards, including Acquisition Prizes from the Kyoto City University of Art Exhibition in 1980 and the Kyoto Selective Exhibitions of Arts and Crafts in 1986, the Fletcher Challenge Ceramics Award in 1990 and 1992, and the Varazdin Prize from the World Triennial Exhibition of Small Ceramics in Zagreb. Her work can be found in many public collections, including Auckland War Memorial Museum, Auckland; British Museum, London; Brooklyn Museum, New York; Museum of Fine Arts, Houston; Museum of Fine Arts, Boston; Saint Louis Art Museum; Smith College Museum of Art, Northampton; Arthur M. Sackler Gallery, Smithsonian Institution, Washington D.C.; Samuel P. Harn Museum of Art, Gainesville, FL; Ibaraki Ceramic Art Museum, Kasama; Kyoto City University of Art; Kyoto Culture Museum; Museum of Modern Ceramic Art, Gifu; and The National Museum of Modern Art, Tokyo. This sensitive work has been both exhibited and catalogued. We hope you enjoy its dynamic, patterned curves!